Adorn yourself in the soft earthy tones from the ocean, ancient and contemporary. This delicate pendant (25mm x 22mm), shaped from fossilized coral beds, has intrinsic beauty in the form of rich flower-like patterning. 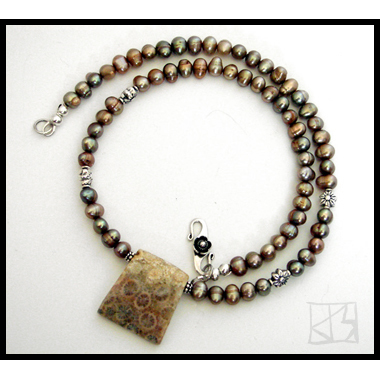 I love working with dichotomy and juxtaposition, and here it's in the ancient center stone matched with contemporary freshwater pearls. 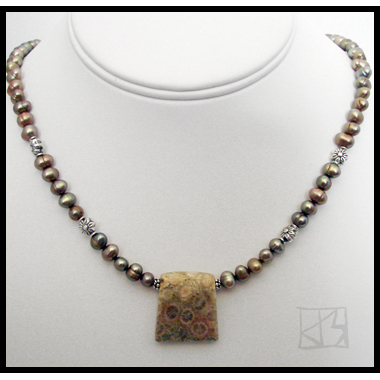 To make sure the pearls don't "disappear" as merely what the pendant happens to hang from, I've handpicked slight variations of colors from several different strands to create interest without, conversely, overpowering the focal piece. The result is a soft and subtle balance that preserves these opposing qualities while creating one fascination whole. Wear a piece of prehistoric beauty unearthed and bring your own inner nature to the surface!